If you like a lot of heat in your wings, then I have a secret recipe just for you. For a limited time Popeyes had ghost pepper wings on the menu. These tender, juicy, bone-in chicken wings are breaded in a southern-style crispy coating that is seasoned with ghost peppers. I will warn you though, ghost peppers are 400 times hotter than Tabasco sauce. So if you’re brave, try these ghost pepper wings. You can adjust the heat by using less ghost pepper in the recipe. This Ingredient In Dental Products Is Destroying Your Teeth! Grind up as many or as few ghost peppers as you feel like in a food processor. I am not responsible for whatever you decide to do with these peppers. Use at your own risk. Add the ground up ghost pepper flakes to the seasoned flour mixture. Use gloves if handling to prevent destroying yourself. If you don’t have gloves then make sure you don’t touch your body. Toss the chicken from the buttermilk into your flour, back into your buttermilk and one more time in your flour to get a nice coating. Deep fry at 365°F for 8-12 minute or until fully cooked on the inside. Today I have a secret recipe for Popeye’s red beans and rice. Tasty, velvety-smooth red beans served with seasoned rice. 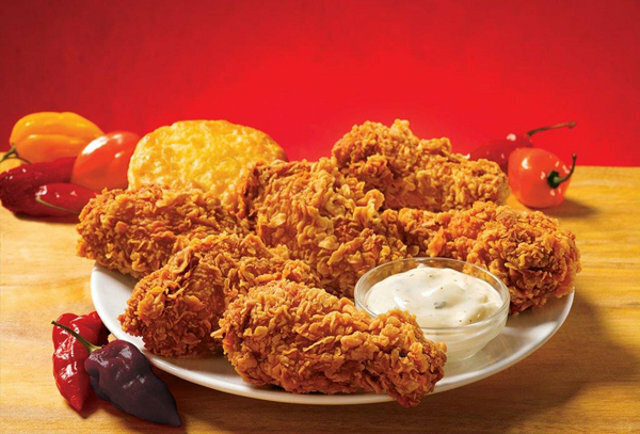 One bite and you’ll see why this is a Popeye’s favorite. Enjoy this as a side dish or an entree. For the most authentic flavor, use a smoked ham hock in this recipe. Pour 2 of the cans of beans into a 2-quart saucepan and add the ham hock and water. Simmer on medium heat for an hour, until the meat starts to loosen from the bone. Remove from the heat and cool until the hock is cool enough so you can remove the meat from the bone. Place the meat, beans, and liquid from the pot in a food processor. Add the onion powder, garlic salt, red pepper, salt, and lard. Process for only 4 seconds. The beans should be chopped and the liquid thick. Drain the remaining can of beans and add to the processor. Process for just a second or two; you want these beans to remain almost whole. Pour everything back into the pan and cook slowly on low heat, stirring often, until you’re ready to serve. Serve over a premium long-grain rice. Today I have a secret recipe for a tasty Louisiana style sandwich served at Popeyes. Their chicken Po’Boy has handcrafted chicken tenders on a French baguette, loaded with lettuce, pickles and mayo. The chicken is double breaded in a hot sauce and egg mixture along with a seasoned flour mixture. The result is an extra crispy and spicy chicken tender. Place chicken strips into a large bowl and pour the buttermilk over the top of the chicken. Cover and refrigerate for 2 hours. In a large bowl mix together eggs, water and hot sauce. In a gallon freezer bag combine flour, pepper, salt, paprika, garlic powder and cayenne pepper. Mix well. Remove the chicken from the buttermilk and place into the freezer bag, seal and shake until evenly coated. Remove the chicken from the bag and dip each chicken strip into the egg mixture and then put back into the freezer bag. Seal and shake again. Heat oil in a deep fryer to 350 degrees F. Fry chicken in batches for about 5-7 minutes or until golden brown and fully cooked (the internal temperature has reached 165 degrees F.), turning as needed. Drain on a plate lined with paper towels. Cut the loaf of French bread in half lengthwise. Lightly brush olive oil onto the cut sides of the French bread. Place cut side up onto a baking sheet. Place into the oven and broil, 5-6 inches from the heat for 1-2 minutes or until golden brown on top. Remove from the oven. Spread mayonnaise onto the top and bottom of the toasted side of the bun. Top the bottom half with sliced pickles, cooked strips and shredded lettuce. When it comes to home-style southern cooking, there’s nothing quite like crispy fried chicken. If you’ve ever tried it before, you know it can be a little tricky to get the right amount of crunch without drying out the meat. 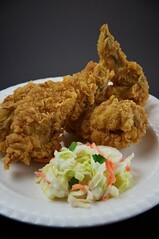 Today’s secret recipe will teach you how to make Popeyes extra-crispy spicy fried chicken at home. Following this recipe will result in an unbelievably moist, perfectly seasoned chicken with a thick crunchy coating. Place cut-up chicken in a large bowl, and cover with buttermilk. Cover and chill for two hours, or overnight. This is an optional (but recommended) step. In a large bowl, add eggs, water, and red pepper sauce. Whisk until combined. In a large gallon freezer bag, mix flour, pepper, paprika, and cayenne. Remove chicken from buttermilk (if marinated) and sprinkle lightly with salt, pepper, and garlic powder. Place all chicken pieces in freezer bag with flour mixture. Shake until all pieces are evenly coated. Remove chicken pieces one at a time, shaking excess flour. Dip each piece in the egg mixture, and return to bag of flour. After all pieces of been dipped in the egg mixture and put back in the bag, give it a second shake to coat chicken pieces again. Heat oil in deep fryer or deep pan to 350 degrees. Working in batches, drop each piece of chicken into the hot oil. Fry for 15-18 minutes, or until golden brown, turning occasionally if oil does not completely cover chicken. Keep in mind that dark meat chicken takes longer to cook than white meat. Watch your wing segments, as well; these will finish cooking first. 1) Lose The “Mommy Belly” & Bring Back Your Flat Tummy! 2) Decorate Cakes Like An Expert! 3) Make Authentic Burritos, Tacos, Enchiladas & More!